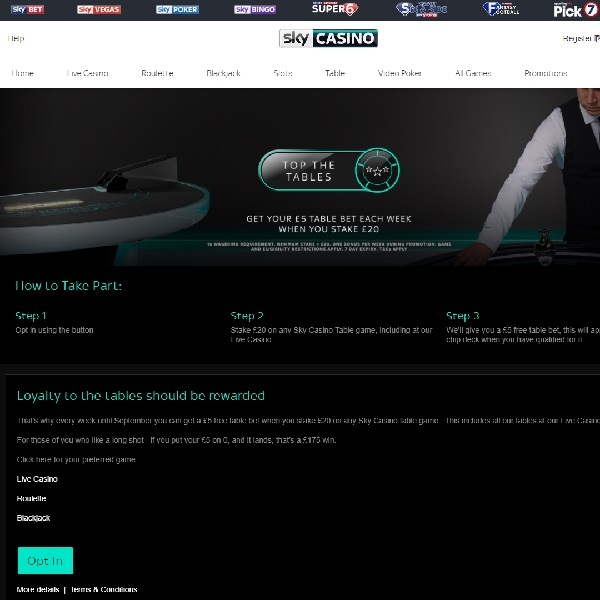 If you enjoy playing online casino table games, both at a live dealer casino and the regular games, then head over to Sky Casino where you can get a free bet. All you have to do is bet £20 or more on any Sky Casino table game, including the live casino tables, and you will get a £5 free bet added to your chip deck. The free bet can then be used at the Live Casino or on regular roulette and blackjack games. Best of all, you can claim the free bet once a week until September. This is a great chance to be guaranteed of getting a little more when you play. If you are going to bet £20 anyway then why not enjoy a £5 free bet as well? Head over to Sky Casino today and start playing to qualify for your bet this week.